Childhood eye problems are detected in our weekly school screening programmes. Evaluation and treatment (surgical/ Non-surgical)of paediatric cataract, glaucoma and squint is done by the concerned specialists. In the year 2008-2009 we have conducted more than 50 school screening camps and are committed to provide a healthy vision to children. Vision screening is aimed at detecting eye disorders of children which are amenable to treatment in the early years of life. The recommendations begin with an exam for general eye health in the hospital nursery by a paediatrician or family doctor, followed by a repeat exam at approximately six months of age. At age 3–4 years, children should again be screened by a Paediatric Ophthalmologist, with an emphasis on testing visual acuity, such as by reading an eye chart of pictures or letters. Vision should be rechecked at the age of five with subsequent routine screening vision exams typically done in school. A Paediatric Ophthalmologist should be consulted if any abnormalities are discovered during these evaluations. An ophthalmologist should also be consulted if a child has any risk factors for eye disease such as a history of prematurity, or a family history of ambylopia, childhood glaucoma, cataracts or eye tumors. When a child is young, the visual system is maturing. Treatment options which may be very effective during a child's early years may offer little or no benefit later in life. For this reason, early awareness of eye health certainly can make a major difference. Refer children who cannot read at least 20/32 with either eye. Must be able to identify the majority of the optotypes on the 20/32 line. Eyeglass prescriptions are given to children for a variety of reasons. Myopia or nearsightedness, which refers to difficulty seeing in the distance, is one of the most common conditions requiring glasses. Myopia typically appears around the age of nine or ten and in its early stages often does not need correction. The typical course, however, regardless of whether glasses are prescribed initially, is for the myopia to increase as the child grows. The age of onset and the final level of nearsightedness are hereditary to a large degree. Astigmatism refers to the eye being out of focus because the cornea or the front surface of the eye is not perfectly round. Glasses can easily compensate for this distortion and are prescribed based on the amount of astigmatism and the age of the child. Hyperopia or farsightedness is another condition which may require glasses. Whereas hyperopia in adults may cause blurring, some amount of hyperopia is normal in children. Unless the amount of hyperopia is very high, children's eyes can focus clearly despite hyperopia. Therefore, glasses may not be necessary. However, if the farsightedness is associated with crossing of the eyes (see Accommodative Esotropia), farsighted glasses would be required to maintain straight alignment of the eyes. Another reason to prescribe glasses is to treat amblyopia or a "lazy eye." One cause for this is one eye being out of focus in relation to the other. For example one eye may have astigmatism while the other does not. In this instance, vision would be clear with both eyes open because one eye is perfectly focused. Glasses, therefore, would be needed to prevent or treat the amblyopia in the eye which is out of focus. Amblyopia refers to reduced vision in one or both eyes caused by visual deprivation. Normal vision is "imprinted" in the brain in early childhood. If this process is interrupted, amblyopia will occur. That is, even with proper eyeglasses, an eye with amblyopia does not see well. It is often reversible with the appropriate treatment. The term "lazy eye" is often used to describe amblyopia. Amblyopia results from actual atrophy of the visual pathways in the brain that allow an individual eye to "see." That is, because of improper stimulation of the involved eye, the portion of the brain serving that eye does not develop properly.Amblyopia affects approximately 2% of all children. There is often a family history of this disorder. The Paediatric ophthalmologist performs all of the necessary tests to confirm that your child has amblyopia. Vision testing is accomplished with the appropriate methods for your child's age. An examination with eye drops that dilate the pupils is generally performed. This permits an evaluation of the internal ocular structures and allows a determination as to whether or not there is a need for eyeglasses. The key to successful treatment of amblyopia, is early detection. See Vision Screening for more information. If the amblyopia is caused by a strabismus, patching therapy is generally recommended. If an anisometropic amblyopia is present, the proper eyeglasses are prescribed, possibly in conjunction with patching therapy. If there is a cataract or other ocular anomaly present, the appropriate surgery may be recommended followed by patching therapy. For achieving the best results in amblyopia therapy, total visual deprivation of the stronger eye is often recommended. For this reason, eye patches that adhere to the skin around the eye are most effective. Strap-on "pirate's patches" and patches worn over glasses or frosted glasses are less effective and usually not recommended. Particularly if a child is resistant to patching therapy, atropine eyedrops may be helpful in certain conditions. Atropine is instilled onto the dominant eye creating a temporary blurring effect which may allow the child to use the other eye with amblyopia - thus "patching without a patch." The Paediatric Ophthalmologist will prescribe the appropriate number of hours that the patch should be worn each day. While undergoing patching or atropine eyedrop therapy, it is critical that your child return for a vision check at the recommended time intervals! This is to safeguard against the development of amblyopia in the eye being patched. Generally, the younger the child, the quicker the desired results are obtained with amblyopia therapy. After about age eight-nine years, the benefit of patching or atropine therapy is questionable. Diplopia, commonly known as double vision, is the simultaneous perception of two images of a single object that may be displaced horizontally, vertically, or diagonally (i.e. both vertically and horizontally) in relation to each other. 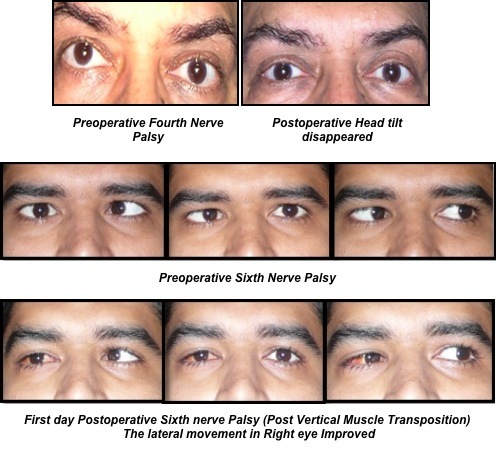 It is usually the result of impaired function of extraocular muscles (EOM's), where both eyes are still functional but they cannot converge to target the desired object. Problems with EOM's may be due to mechanical problems, disorders of neuromuscular junction, disorders of the nerves (III, IV, VI) that stimulate the muscles, and occasionally ingestion of toxins. Diplopia is often one of the first signs of systemic disorders, particularly to a muscular or neurological process, and it may disrupt a person’s balance, movement, and/or reading abilities. Efforts must first be made to identify and treat the underlying cause of the problem. Thorough evaluation by a Strabismus or squint specialist is a must. Treatment options include eye exercises, wearing an eye patch, prism correction and in more extreme situations, surgery or botox. A squint persisting after 4 months of age should be reported to a paediatric ophthalmologist. Few squints in children can be corrected with glasses alone. If required, squint surgery can be done as early as 6 months of age. Squint, if left untreated can lead to lazy eye. Early treatment gives the child good vision, depth perception and cosmetically straight eyes.